It's week 4 of the Calling it Home One Room Challenge sponsored by House Beautiful and the "bones" of my Principle Bedroom/Office are complete! I enlisted the help of my brother Paul of Brancon - finished carpenter, contractor extraordinaire and master problem solver. 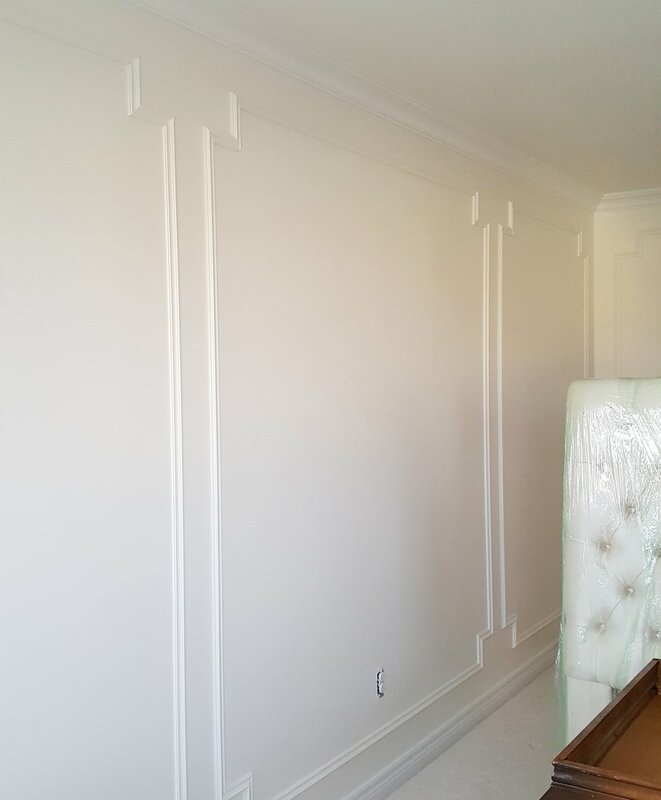 Thanks to some trim, crown moulding, a ceiling medalliion, Benjamin Moore's "Cloud White" paint and Paul's meticulous execution, my room was transformed from builders bland to Parisian pretty in under a week. As we wait for the paint to dry I'm working ahead on a few redesigned find DIYs and thinking about the final touches that will make this room a showstopper - including art. My creative process always begins with working with pieces clients already have and love and that was no exception in my own space. I have been collecting original art mainly from local artists for about the past 10 years and for me, it's a must-have in any space I design. For my very first One Room Challenge, I worked with my very favourite client, my daughter Lily, who wanted a "Wall of Girls" in her room. We looked through Orillia galleries as well as online. She really gravitated to Marin Devine's "girls" - so vibrant and colourful - perfect for Lily. We purchased an original work on canvass as well as several prints which really brought her space to life. As we looked for art for Lily online we stumbled across a painting by the incomparable Anna Kincaide and as soon as I saw it I knew that I needed to feature her work somewhere in a future space of my own. Not one to give up, I found her Instagram account and followed both her and my motto of "When in doubt, reach out". I sent her a message and asked her if she had ever considered prints. She said she hadn't at the time but lucky for me, shortly after she announced on Insta that she would have her first ever release of limited edition prints! Now I am in by no means saying that I was the inspiration behind her print releases but I do believe that I was meant to have her work in my home and with a little luck and great timing it happened :) I've been one of her biggest fans ever since and have created another fan in my sister Erin. Both of us were able to snap up a print from each one of Anna's three print releases this year and my sister's husband also bought her one of Anna's originals for her birthday! I'm in the progress of framing these beautiful prints right now at The Shadowbox in Orillia and can hardly wait to see them in my finished space. do I mix contemporary art by anna kincaide with a traditional frame? For my gallery style art installation, I'll mix ladies in full colour by Anna Kincaide, Jenny's Print Shop and Raven Roxanne with black and white female and floral silhouettes by Sandra Bell (my bestie since I was 14), Allison Hobbs and Lynne Millar. 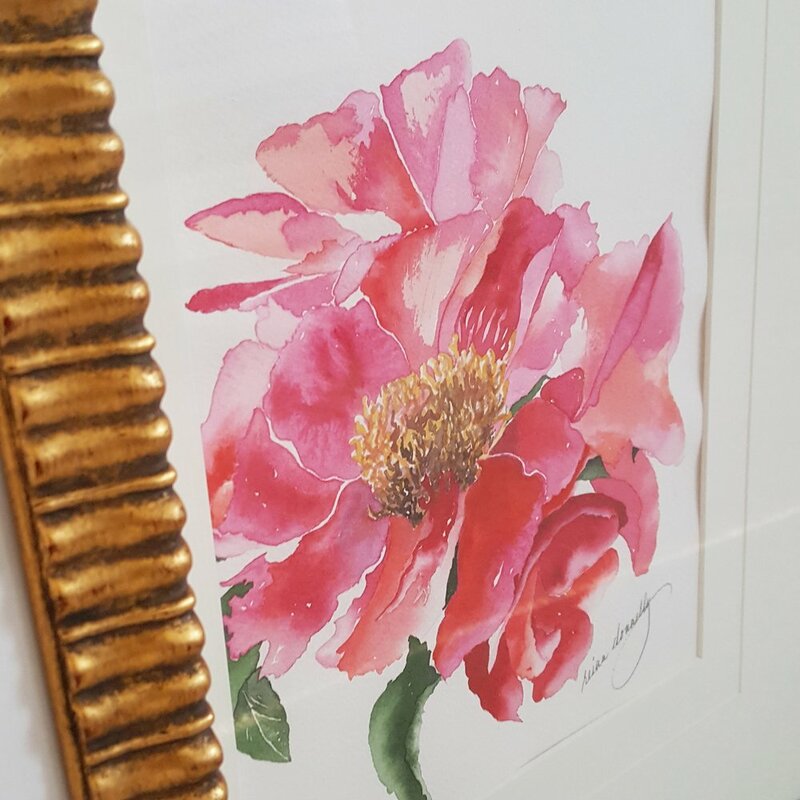 To add some softness, I'll layer in some florals by Lynne Millar and Orillia artists Ingrid Seyffer, Reina Donnelly and my own darling Lily. I can hardly wait to see these pieces set against a creamy white backdrop. It's going to be beautiful!